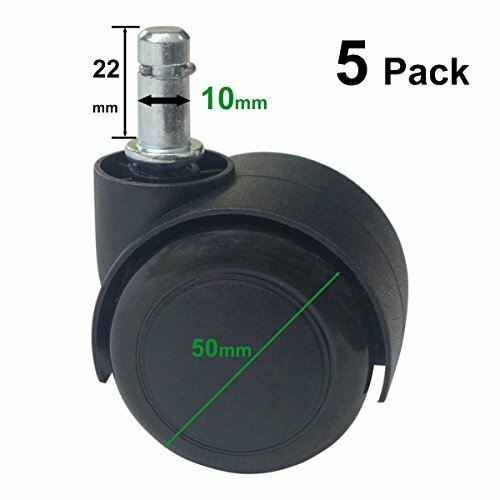 MySit 2" Ikea Casters 10 mm Stem 5 Pack, Heavy Duty Rubber Office Chair Castor Wheel Replacement (CasterIkea5027_Blk) The diameter of the stem is 10mm not 3/8"(9.5mm). Fits Ikea Volmar, Malklom, Gregor, Markus, Partik, Jules, Fingal, Torkel and many more. NOT Compatible with Regular 11mm Diameter Stem Caster. For regular 11mm Stem Caster Please Buy Assin B01FCQJ4GM. NOT Compatible with Regular 11mm Diameter Stem Caster, Please Measure the Stem size of the old caster before buying in case of wrong specification.